This week I'm drinking English breakfast tea from Adagio Teas. They describe it this way: "Black Keemun tea from the Anhui region of China. . . . [P]rized for its rich smoky flavor, and sumptuous aroma." As always, I drink it black and unsweetened. I just finished listening to A Killing Frost (aka The Third Day, The Frost) by John Marsden, which is the third in the Tomorrow series. I'm not quite sure what genre these books are. I guess I would call them alternate history. In brief, Marsden imagines what would happen if Australia were invaded by enemy forces and then follows a group of high schoolers who have managed to avoid capture. (For more, see my review of The Dead of the Night.) This book takes place about six months after the invasion, and the teens are forced to face the consequences of their guerrilla tactics. My review will be posted in a day or so. Because the kids must scavenge for supplies, I suspect that they are drinking a rather common tea. And even if they aren't, they have become nostalgic for the comforts of their old life. So English breakfast tea is an excellent match, and the teens would approve. What have you been reading or listening to this week? What do you pour into your glass or mug when you sit down for a good read? English breakfast tea is the one I'm most familiar with, although I've not tried Adagio. I remember your review of the previous book. Nice to hear the teens are still alive. You're right, those kids would probably be happy to have any kind of tea. I know its a bit barbarian, but I do like a bit of wine with my books! Of course, this is not an every day thing, but rather a nice Friday evening thing. Otherwise, it's iced green tea or water! Sandy: I've seriously considered substituting mini wine reviews for the tea (still calling it Thursday Tea, just changing the beverage). If you're so inclined, you should join in with wine instead of tea. I'd love to read your wine/book connections. Yum, the adagio tea sounds delicious and will have to try it. Marsden's series reminds me a big of the movie "Red Dawn" High schoolers tried to avoid capture in that one as well. Will have to check out the series. Thanks Julie. I love getting tea samplers and tea samples, so I have tons of different kinds in the house. I'm having so much fun trying to guess which tea to use for which book. I had so much fun writing my post for this meme! I must admit that your tea sounds MUCH nicer than the one I was drinking, though. I might have to pick up the first in the series that you're reading as well. 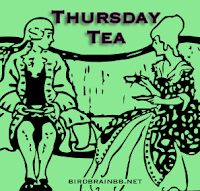 I enjoy reading your Thursday Tea posts! I generally drink English breakfast in the afternoon, so I have to get the decaf version. The Marsden series definitely sounds interesting. I usually drink English breakfast but have to go decaf in the afternoon. Recently I have been drinking Lady Grey and Chinese Oo-long. A cup of tea and a book would make heaven for me.